As summer moves into fall pool days and sunglasses are replaced with warm sweaters and pumpkin spice lattes. While some people might mourn the end of sunny days and hot temperatures, there is a lot to appreciate about the changing of the seasons. I love this time of year for so many reasons. These are the weeks to go apple picking, to schedule a pumpkin carving party, and to pull out all of the flannel shirts you put away last year. As leaves on the trees begin to change from green to yellow and red, even a simple walk down the street can be an opportunity to lift your mood by viewing these vibrant colors. Fall Might Just Be the Most Beautiful Season of the Year! If you have the time, it’s worth scheduling a day trip or extended weekend to visit some of the best foliage viewing spots in the country. “Leaf peeping,” as those in New England call it, has grown from a popular local pastime to an expanding profitable industry with people traveling the country to view peak foliage. There is no shortage of great places to visit this fall, but here are 7 areas you don’t want to miss! There’s certainly something to be said for tradition. So when you’re talking about fall foliage, it’s impossible not to mention Vermont. Start your drive slowly on the iconic Green Mountain Byway in Waterbury and follow Route 100 North for miles of epic leaf viewing. Along the way, you’ll pass “Vermont’s finest” – Ben & Jerry’s factory, which offers short tours that end at the ice cream shop. Ice cream and leaf peeping might just be the best day ever! Continue along this route until you arrive in Stowe, where you can stop for the night at the historic Stone Hill Inn. If you have time, continue your drive on Route 118 to Montgomery which is known for its picturesque covered bridges and quintessential Vermont landscapes. Foliage peaks for about a month between the middle of September and the middle of October. 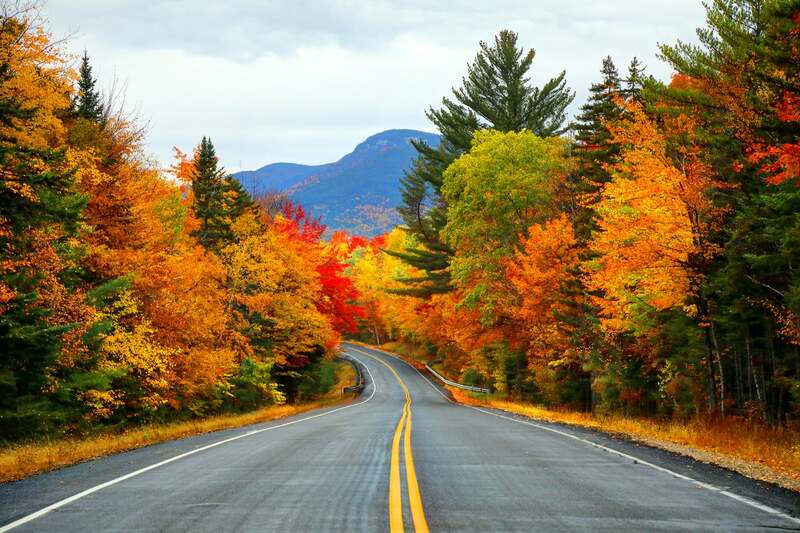 Leaf peepers often opt to travel this stretch of road at the end of October after peak season to take advantage of hotel discounts while the foliage is still vibrant. New Hampshire holds a special place in my heart for 2 reasons – lobster rolls and fall colors. New Englanders take this unofficial holiday seriously, updating foliage trackers, creating foliage inspired playlists, and frequently posting pictures of enviable leaf peeping outings. Yes, you might experience a bit of traffic due to the number of people out viewing the leaves this time of year, but what’s the rush? This is an opportunity to slow down and enjoy the colors along with everyone else. Take a day or 2 and drive the 100 miles of Pinkham Notch Loop for views of the Presidential Mountains during peak foliage season. If you have a bit of extra time, take a detour and drive up the Mount Washington road to the summit. On a clear day, you’ll be able to see the entire mountain range. Mid-September through mid-October is usually the best time to view the foliage, but each year varies slightly depending on when the nights start to cool off. Most people associate fall foliage with New England, and for good reason. While these states are spectacular areas to visit as the leaves are changing, there are several other stunning spots to view foliage that deserve some attention. I wouldn’t necessarily describe the Boston Mountains in Ozark National Forest as completely off the grid when it comes to foliage viewing. But this area certainly is less well known than other more established spots. That might be reason enough to visit. Dense, uninterrupted oak, birch, and maple forests provide ideal leaf peeking opportunities in the fall. There’s also great climbing and hiking at Sam’s Throne, for those who are looking to get out of the car and move around a bit. As the nights become cooler at the end of September, you can travel down Highway 71, located just south of the town of Fayetteville to see some spectacular fall colors. There are several places to pull off for a short day hike, and small towns offering shopping and dining options line the route as well. In the Rocky Mountains, a different kind of foliage emerges as the leaves on the Aspen trees transition from green to a vibrant gold color. Boreas Pass, located just outside of Breckenridge, Colorado is one of my favorite areas in the West to view fall foliage. A 10-mile passage nicknamed “Aspen Alley” offers stunning views of uninterrupted aspen forests that turn completely gold in the fall. Queue up your foliage playlist and put on Coldplay’s song “Yellow” as you drive through the trees for music to match the scenery. Determining when to go can be tricky. Every year is a bit different due to unpredictable weather in this area, and there’s usually just a short 2-week window in which the colors are changing. It’s always best to keep an eye on the foliage trackers before booking your trip. Typically, the foliage peaks in mid-September. Seven million acres of hardwood forest in Michigan’s Upper Peninsula make this area a popular spot to view changing fall colors. Since it is a bit more remote than other traditional leaf-peeping destinations, this is a place to travel if you’re looking for quiet and solitude. There are several different established foliage viewing routes ranging from 100 to 200 miles long. So you can plan to take an extended weekend to maximize your time here. In the Upper Peninsula, leaves begin to turn yellow then red during the second half of September through mid-October. If you’re finding it hard to justify a foliage viewing trip in mid-September, right after the Labor Day weekend, consider traveling to Victoria’s Butchart Gardens in October instead. This is when the colors peak in the Japanese Gardens and you’ll see what some folks describe as “fire foliage.” There are many different varieties of Japanese maples and ornamental foliage surrounding water features and manicured pathways. Viewing fall colors at a Botanical Garden might seem like a strange suggestion, but so many people recommended Butchart Gardens that I had to add it to the list. Plus, Victoria, British Columbia is a fun place to visit regardless of the season. Sometimes it’s completely worth venturing off the beaten path to explore a less-traveled area. While the Dixie National Forest doesn’t make many of the “best foliage” lists, I’m excited to share this secret spot. Start on Highway 12 in Grover, Utah and head south through miles of golden Aspen forests. There are many places to pull off for a day hike through the trees and there’s a good chance you’ll be the only one on the trail. As you continue on Highway 12, the road will start to climb up through Capital Reef National Park, providing incredible views of the area and the rock formations below. When you arrive in Boulder, Utah, stop for a meal at Hell’s Backbone Grill & Farm. This James Beard Award nominated restaurant is one of the most remote eateries in the US. And because it’s so difficult to receive deliveries, they grow all of their own food in the garden adjacent to the restaurant. To glimpse the Aspens at peak foliage, travel here as the temperatures start to cool off in September or early October. Where is your secret spot for seeing the best views fall has to offer?